Show the world what the ocean and Great Lakes mean to you. In celebration of national Get Into Your Sanctuary events, NOAA's Office of National Marine Sanctuaries is hosting a photo contest. From May 25 through September 2 (Memorial Day weekend to Labor Day weekend), send us your best photos of the National Marine Sanctuary System and help us celebrate the beauty and importance of these special places. Winning photos will be featured in next year's Earth Is Blue Magazine and on the Earth Is Blue social media campaign. To view the winners of the 2018, 2017, and 2016 contests, click on the images below. 2018 1st Place, Sanctuary Views: Donna Hendricks. 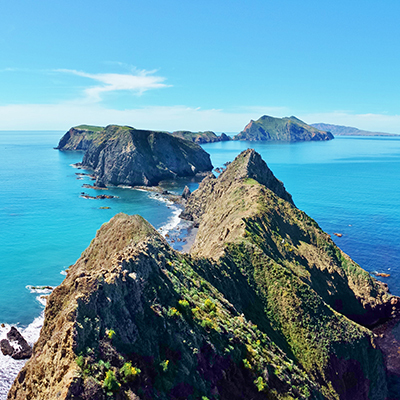 Inspiration Point on Anacapa Island, Channel Islands National Marine Sanctuary. 2018 1st Place, Sanctuary Life: Douglas Croft. 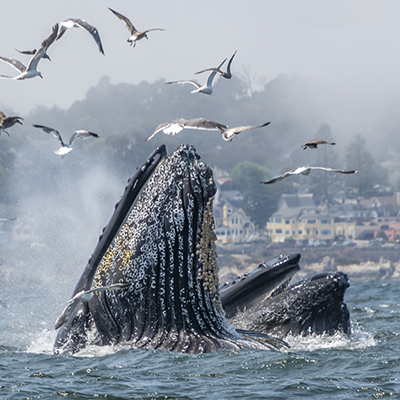 Humpback whales feed on anchovies in Monterey Bay National Marine Sanctuary. 2018 1st Place, Sanctuary Portraits: Bryan Dort. 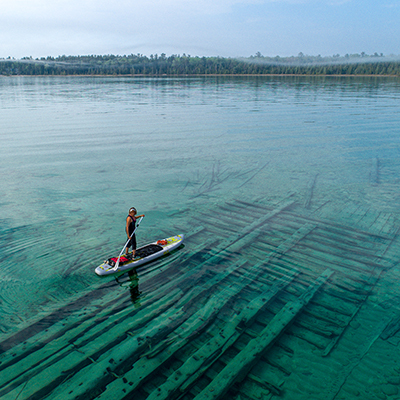 A stand-up paddleboarder floats over the shipwreck of the steamer Albany in Thunder Bay National Marine Sanctuary. 2017 1st Place, Sanctuary Views: Michael Beattie. 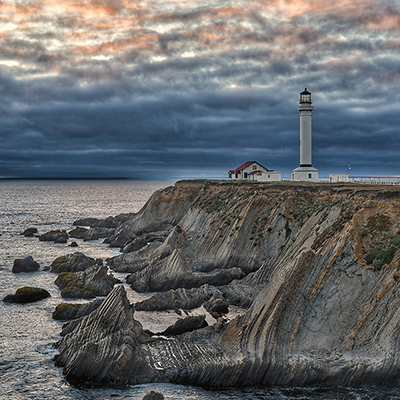 The Point Arena Lighthouse, Greater Farallones National Marine Sanctuary. 2017 1st Place, Sanctuary Life: Curtis Wee. 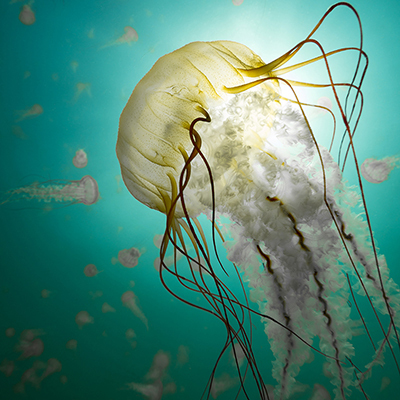 A bloom of sea nettles drifts through Monterey Bay National Marine Sanctuary. 2017 1st Place, Sanctuary Portraits: Douglas Croft. 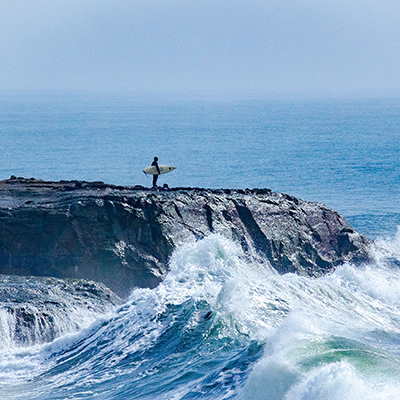 A surfer contemplates the swell at Lighthouse Point in Monterey Bay National Marine Sanctuary. 2016 1st Place, Sanctuary Views: Jason Jaskowiak. A foaga site on Tutuila Island, National Marine Sanctuary of American Samoa. The basins in this volcanic rock have been worn over the years by people making stone tools. 2016 1st Place Sanctuary Life: Christina Parsons. 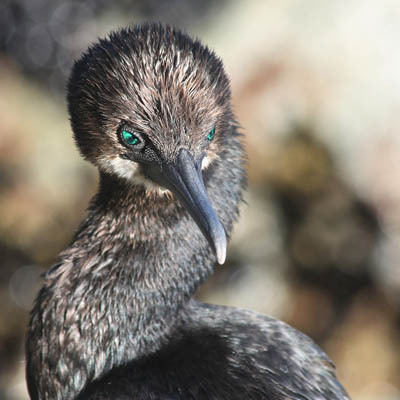 This young Brandt's cormorant was photographed preening on the rocks on the Coast Guard Pier/Breakwater in Monterey Bay National Marine Sanctuary. 2016 Place Sanctuary Portraits: Selah Preskey Martin. 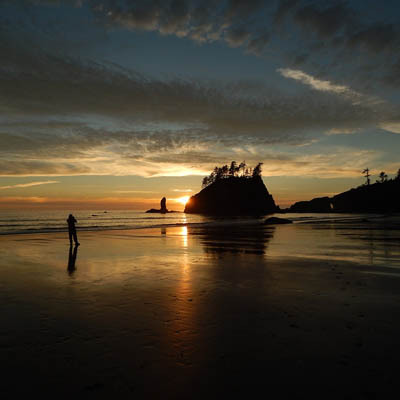 A photographer captures the sunset at Second Beach in La Push, at Olympic Coast National Marine Sanctuary. Remember to practice responsible recreation when taking your photos! 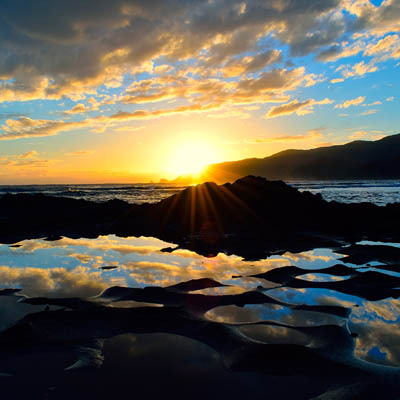 Sanctuary Views: Share your photos of beautiful sunsets or scenic shots of your favorite national marine sanctuary. Sanctuary Life: Send us your best photos of sanctuary inhabitants like fish, birds, marine mammals, and other amazing ocean creatures. Sanctuary Recreation: Enter your best images of people enjoying national marine sanctuaries, whether they're boating, kayaking, diving, swimming, conducting research, or just hanging out on the beach. Submit your images (minimum of 1200 pixels wide, no more than 10) to us at earthisblue@noaa.gov. All images MUST include the following information: photographer's name, short description of when and where the photo was taken, and what is shown in the photo. If you would like us to tag you on Instagram if we share your photo there, please include your Instagram handle as well. For photos of protected species like marine mammals, help us highlight wildlife photography best practices, and indicate what kind of camera/lens you used and the approximate distance from which you took the photo. Animals need plenty of space to stay healthy and safe, so let's share our collective knowledge of responsible photography! Photographers must be at least 13 years of age or older as of the first day of the contest (May 25, 2019). We will assume that, in submitting a photo, you are the owner of the photo and have the right to publish it (including permission/model release for anyone identifiably pictured). By submitting a photo, you are giving us permission to use the photo for other purposes, such as on our website, on social media, and in other NOAA and National Marine Sanctuary Foundation publications. We will, of course, provide credit to photographers whenever we use any of the photos. Organizations other than NOAA and the National Marine Sanctuary Foundation may use photographs submitted in this contest to promote sustainable and responsible recreation in the National Marine Sanctuary System. These photos are not for sale and are not for commercial use unless prior permission is arranged. Only photos taken while in compliance with wildlife viewing regulations and government approach regulations will be considered. Do not harass animals just to get the "perfect" shot! Photos that are submitted without information on the photographer and a brief caption will not be considered. No watermarks on submitted photos. Photos should be a minimum of 1200 pixels wide (but the bigger, the better!). Please limit the total number of your photo submissions to 10 entries. Ready to Submit Your Photos?